Who invented the Hovercraft? The name of the person credited with inventing the Hovercraft is Christopher Cockerell (1910 - 1999). Christopher Cockerell is not only famous as the English inventor of the Hovercraft but also as a designer and engineer. When was the Hovercraft invented? Christopher Cockerell invented the air cushion supported vehicle known as the Hovercraft in 1955, during the Cold War period of invention. Definition of the Hovercraft: The Hovercraft is defined as a transportation vehicle or craft, an air-cushion vehicle or ACV, that travels quickly over land or just above the surface of water on a cushion of air provided by a downward jet from its engines and propellers. Fact 1: Who invented the Hovercraft? The Hovercraft was invented by Christopher Cockerell in 1955 during the Cold War era of inventions. Fact 2: Who invented the Hovercraft? Prior to the invention of the Hovercraft in 1955, there was a great deal of interest in air cushioned vehicles. In the 1870's the British engineer Sir John Thornycroft produced his theory that an air cushion system would reduce the drag of water on boats and ships. Fact 3: Who invented the Hovercraft? Various experiments were conducted by inventors of air-lubricated boats including Dagobert Muller von Thomamhul for the Austrian navy in 1906. 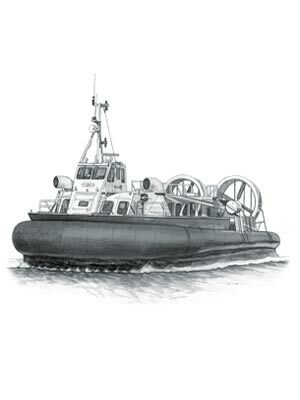 Fact 4: Who invented the Hovercraft? Other inventors such as Joseph Clark, Charles Theryc, James Porter, Charles Worthington, V.F. Casey, Douglas Kent Warner all contributed to the foundation for the various forms of ACV (air cushion supported) vehicles. Fact 5: Who invented the Hovercraft? The problem of how to retain the cushion of air beneath the vessel prevented further development of air cushion supported vehicles until Christopher Cockerell invented the Hovercraft in 1955. Fact 6: Who invented the Hovercraft? The inventor of the Hovercraft, Christopher Cockerell, was born at Cherry Hinton near Cambridge, England on 4 June 1910 and died on 1 June 1999. Fact 9: Who invented the Hovercraft? Following his education his first job was with a firm of Mechanical, hydraulic and electrical engineers called W. H. Allen & Sons of Bedford. Fact 10: Who invented the Hovercraft? In 1934 Christopher Cockerell returned to Cambridge University to study radio and electronics and then gained a research position at the Marconi Company. Fact 11: Who invented the Hovercraft? In 1935 Christopher Cockerell married an art student, called Margaret Elinor Belsham and the couple had two daughters. Fact 12: Who invented the Hovercraft? During WW2 (1939 - 1945) Christopher Cockerell worked with noted scientists including Robert Watson-Watt who invented Radar in 1939. Fact 13: Who invented the Hovercraft? The invention of the Hovercraft began when the Cockerells bought a small Norfolk boat hire company, Ripplecraft Company Limited, that hired out boats on the Norfolk Broads, a network of navigable waterways consisting of lakes and rivers created as a result of flooded medieval peat excavations. Fact 14: Who invented the Hovercraft? The Ripplecraft company was not very successful and Christopher Cockerell began to look for ways to make his boats faster and better suited to the Norfolk Broads. Many of the boats were specifically designed to address the particular limitations found on the Broads, particularly the low bridges and the shallow waters. Fact 15: Who invented the Hovercraft? As Christopher Cockerell conducted his research he became interested in Sir John Thornycroft's theory that an air cushion system would reduce the drag of water on boats. The Thornycroft company had continued to work on boats long after the death of Sir John Thornycroft and produced a small vessel had been partially raised out of the water by a small engine. Fact 16: Who invented the Hovercraft? Christopher Cockerell reasoned that if the entire boat was lifted from the water, the vessel would effectively have no drag and would achieve a much higher maximum speed than other boats. Fact 17: Who invented the Hovercraft? Christopher Cockerell's theory was that instead of using the plenum chamber, an air transfer system that Thornycroft had devised that he could create a completely different system. Cockerell's idea was that air could be pumped more efficiently around the perimeter and underneath the boat, flowing towards the center thus creating a more effective air cushion. Fact 18: Who invented the Hovercraft? The concept of using a peripheral jet would allow the air pressure to build enough to equal the weight of the craft and, as the air would be trapped, the pressure would elevate the craft completely off the surface on which it traveled. Fact 19: Who invented the Hovercraft? Christopher Cockerell developed his ideas over a number of years, tested his theories and in 1955 built a working model of the hovercraft. The idea of using peripheral jets, aided in the balancing of the hovercraft while it was hovering, and therefore increased the stability of the hovercraft. Fact 20: Who invented the Hovercraft? Christopher Cockerell had constructed a vehicle that could travel on a cushion of air. Fact 21: Who invented the Hovercraft? On December 12, 1955, Christopher Cockerell was issued the Hovercraft's British Patent number 854211 for Improvements in or relating to vehicles for travelling over land and/or water. Fact 23: Who invented the Hovercraft? On July 25, 1959, Cockerell's invention, the SR.N1 Hovercraft crossed the English channel from Calais, France to Dover, England and later went into commercial service ferrying passengers from the UK to France. Fact 24: Who invented the Hovercraft? Christopher Cockerell was given scant financial reward for his invention but he was appointed CBE in 1966 and knighted in 1969. Fact 25: Who invented the Hovercraft? Sir Christopher Cockerell died on 1 June 1999. He was a prolific inventor but will always be remembered for his invention of the Hovercraft.